So, here we have what is probably the most unusual chart hit of the 80's, if not all time, and it certainly divides opinion. While many see it as a groundbreaking piece of art rock, others believe it's simply a load of pretentious old tosh! I guess, you either love it or you hate it! The original song was created by experimental performance artist and musician Laurie Anderson. This minimalist piece unexpectedly rose to No.2 on the UK Singles Chart in 1981, with a little help from Radio 1 DJ John Peel. Anderson was little known outside the art world until the release of this song. The fact that this track made it into the mainstream chart is pretty incredible. The American-born musician has many talents. She is a sculptor, violinist, vocalist, composer and also plays the synclavier. She married the rock musician Lou Reed in 2008. O Superman features on the album Big Science, which is now considered a minimalist classic by many critics. The album reached No.29 in the UK. 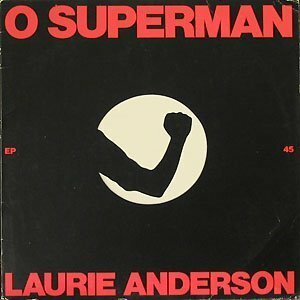 Far from being a one trick pony or a novelty act, Laurie Anderson created an album of haunting, extraordinary and highly original tracks. Think of Art Of Noise and Bjork and you get a vague idea of the the influential style of music Anderson was creating here. It's experimental, but also very well structured which is a good combination.